If your natural style becomes a default option, you're going to find it difficult (if not impossible) to resolve certain conflicts, because some styles are poorly suited to certain situations. 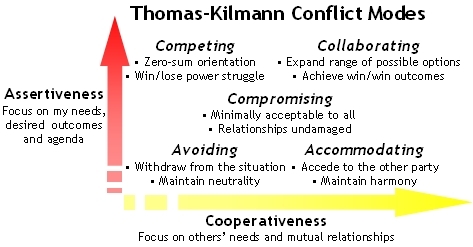 All of the Thomas-Kilmann modes can be used effectively in the right context, and it's important to develop the ability to choose the mode that best fits the situation and to increase our level of comfort with alternative styles. Ron Kraybill has developed an alternative to the TKI, the Kraybill Conflict Styles Inventory. Kraybill's version uses a Likert scale rather than forced-choice questions employed in the TKI, and it provides answers for what Kraybill calls "calm" and "storm" conditions, noting that our styles may change under stress. Kraybill also offers a version that distinguishes between "individualistic" and "collectivistic" cultures. It's worth noting that the TKI and Kraybill's version are built on the Managerial Style Grid, developed by Jane Mouton and Robert Blake in the 1960's. (Here's a larger version of the graph below.) 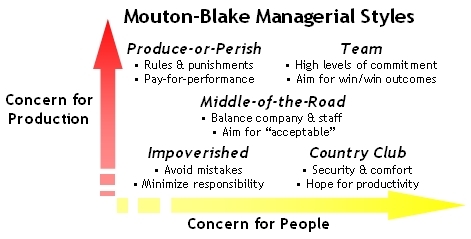 Mouton and Blake's work is carried on by Grid International, which provides leadership development and organizational culture consulting services.